4.5 notes : All issues with textures not working correctly should be remedied now. Infinite Power / Charge is no longer in the main version but replaced with the 5/100th's drain on fusion cores. 4.4 Notes : Included Railroad paint scheme for all base armor types. -If you have purple texture issues, make sure you download the latest version of this mod, Extract and install it manually and overwrite all the files when prompted. -Download the alternate Institute Material Package from the optional files if you still have this issue. 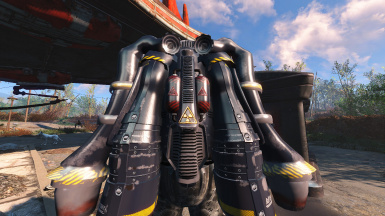 In game : if you have a jet pack equipped and it has the render issue, unequip it, save your game and reload.. then re-equip the pack.. it should then be rendering correctly. 4.3B Notes : Fixed Institute material issue, fixed AP regen issue, adjusted jet pack drain to rely on fusion core only. 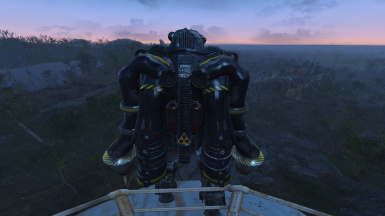 Fusion Cores charge (slowly) from Jet pack use instead of drain. 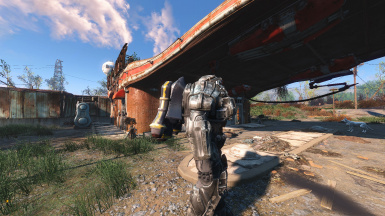 -Fixed naming issue at the Power Armor Station for other power armor types. 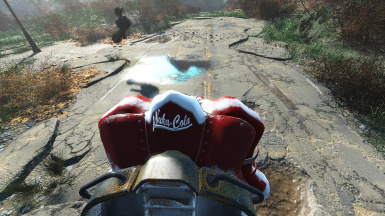 -Fixed VFX for other power armor variants not showing correct VFX. -Added a suspicious looking rock around the Red Rocket Truck Stop that contains all the plans, for those that can't craft it. 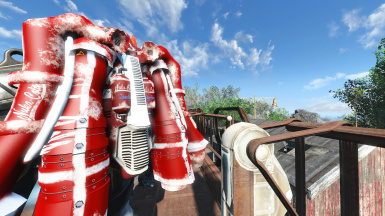 This mod is underrated, love the new look. I know its been awhile since this has seen an update and the author may have gone on to other things, but if anyone has gotten this to work with the X02 & 03 armors, please let the rest of us know. Edit: So, I patched this myself to function with the X-02 and X-03. Going to try to get in contact with mod author to see if he minds public sharing of patch. 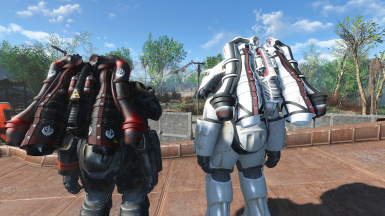 Would be nice to see compatibility with the X-02 Power Armor, or if anyone could make a patch for it. 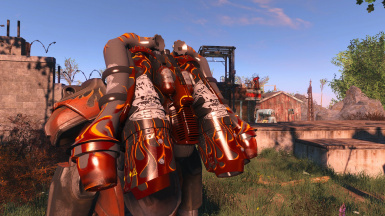 What powers armor mods are you using? 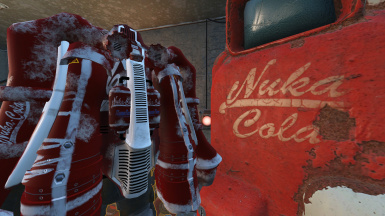 Those are all default (4k hi-res) power armors with the exception of the Nuka-Cola PA and the later screenshots of the Silver-ish looking PA, which is a Gorilla paint theme I believe.. or something like that. There is the Enclave PA also, but that's not officially supported here. 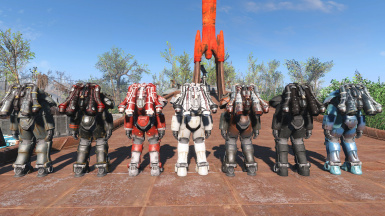 Something you can add yourself if you use the Enclave PA mod, assets for it to work are included in 4.5.
i don't use power armor but these jet packs look really badass. nice mod. Thanks! 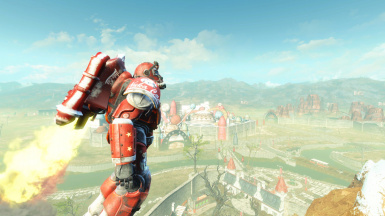 I find this makes power armors more aesthetically appealing all around and they actually look like they could lift what is at the very least 500-600 pounds of armor and frame off the ground. 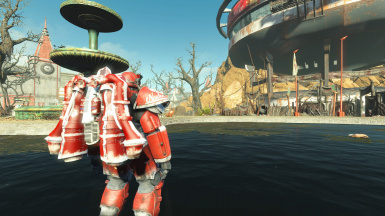 I was still getting purple textures with the institute skins even with the material fix. I examined the textures and discovered a designation error with three files. and all the skins will render properly. No more purple textures YAY!!! Thanks for that! So many textures to keep track of I didn't bother to check my spelling. I'll have the main file updated with this clerical error fix. Gald to help my friend! I know how complex mods can get and it is a lot to keep track of. I love your jetpacks btw! Thank you for creating and sharing!! My pleasure! I love making mods! Thanks again for posting with this. I might not have noticed it with so many other things I am working on right now. 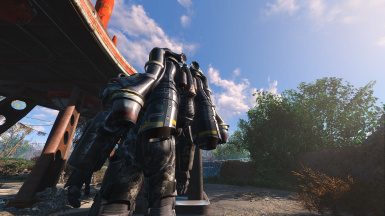 These jetpacks are sweeet! Nice work! I installed the EAGLE jetpacks with the no recharge esp. 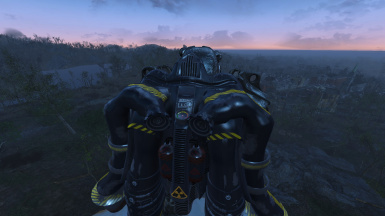 I am additionally using Cross's Jet pack by Niero, and after installing this mod, the Cross Jet pack shoots me into the stratosphere and has waaaay stronger propulsion. Is this normal? 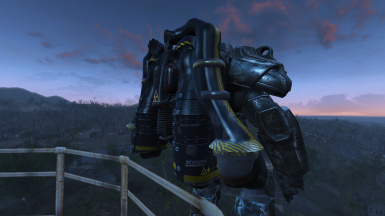 Normal as this mod alters the Jetpacks power levels for longer / higher boosts. I don't know what settings or alterations Cross makes to that system so.. there's obviously going to be some conflict.. try loading CROSS after this mod. It's a fun conflict to say the least, granted I do have to wear Freefall leg armor ;-] I'll try rearranging my load order. 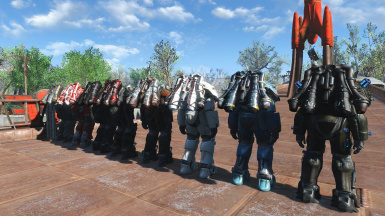 Thanks for your response and awesome jetpacks! Is there anyway to get this mod working with zephyr warriors f4 pa overhaul? Without making a patch for it specifically.. no. It should work with power armors in general but if they changed the slots for how PA upgrades work that's a lot of work I unfortunately don't have time for. 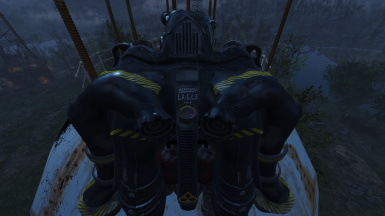 Zephyr made the jet pack a separate part(among other changes). 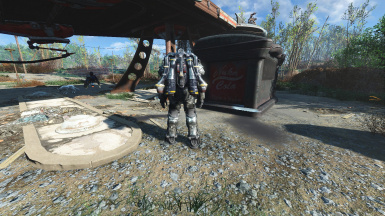 I've tried to make something myself but your jet packs just get added on to the existing jet pack instead of replacing the model. Would you consider making a version which doesn't affect the AP or core drain/charge? 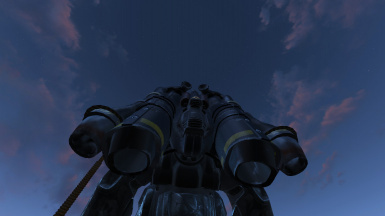 Also, I tried equipping the jetpack(bos version) but it is invisible for some reason. EDIT: New ESP available that does not recharge fusion cores on jet pack usage. The AP drain will remain deactivate because I view it as a stupid waste of a completely different game mechanic. 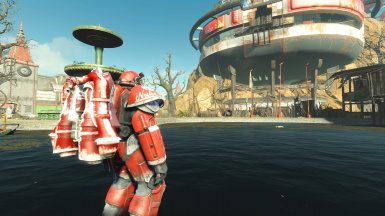 As for the missing jetpack, make sure the textures and materials are present in Data\Materials\Actors\EagleJetpack_BoS, and Data\Textures\Actors\Eagle_Jetpack_BoS, if they are there may be some other unknown conflict, or it is possible you're using it on a power armor set I do not support with this mod. Umm, can you please post a screenshot on where to find it? or a guide at least.